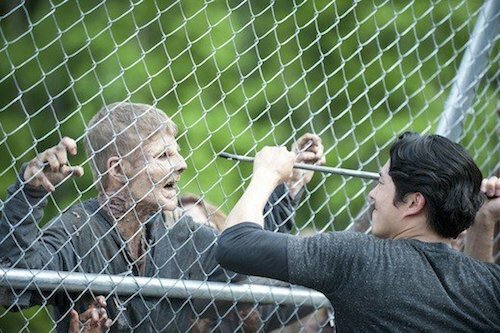 In the world of The Walking Dead, the zombies aren’t your biggest problem – it’s empathy. Caring for others will get you hurt, will get you killed, and considering the entirety of last season was dealing with the ramifications of not caring enough, “Infected” begins to answer the question of what happens when people care too much. “Infected” picks up right where the last episode left off, with another decent horror film-like sequence continuing the trend from last week. Zombie-Patrick is let loose upon the group, and while it does force the audience to have a certain sense of disbelief, it does highlight how much of a false sense of security the survivors have gained in their new home. The apocalypse is still happening outside, and the people inside just got reminded of that. Rick was also forced to take a reality check this week, as he was pulled out of his farming retirement to begin making decisions again. It’s great to see Rick finally having to deal with the fact that this world is suited to how he handles things, and that Farmer Rick is merely a fantasy that he will never really be allowed to live during the zombie apocalypse. Yes, it does look like he may be walking back down the path he walked last season, with all the close ups of Rick looking suitably wild and angry as he puts down the zombie horde, but it was also nice to see the sadness in his realization that was who he needed to be, as he sacrificed his pigs for the greater good. Carol, however, seems to be the only one in the apocalypse who actually has her head screwed on the right way. Her tough love act with the two girls is the standout moment of the episode, especially when she tells them very bluntly that they are weak. She understands through the loss of both her abusive husband and her child that empathy doesn’t work for the dead, or the dying, and the best way to deal with them is a swift death. Carol’s acceptance of the way things are is only augmented by Mellisa McBride’s delivery , as she scolds the children with the same intensity a mother would when her child runs with scissors. But Carol’s not the only one dealing with loss. This episode also gave us the biggest hint into Michonne’s life before the infection began. I was worried that this plot line would devolve into Michonne sulking for the remainder of the episode, but her reaction to the baby crying was a welcome surprise, as it gave depth without destroying her mysterious persona. A daughter? Niece? We probably won’t find out and I hope we never will. Outside of character moments, we once again were treated to more disgustingly amazing blood and gore. The zombie dragging its intestines around was suitably gross and it’s surprising it wasn’t done earlier. Karen, who I was certain was going to get killed in the pre-credits sequence, ended up completely immolated, which was incredibly disturbing. It’s bad enough that the survivors were split between infected and uninfected, but for one of the only people to show symptoms to be burnt alive? That does not help with the already rock bottom morale, and it is sure to create a split in future episodes. It seems directly tied to the person who was feeding the zombies rats at the beginning of the episode, and is beginning to sow the seeds of mistrust throughout the group. In the end “Infected” continues to show the viewers what happens when the group dynamic of last season is completely reversed, and while it continues to strain on audience acceptance of how these events occur, it still manages to maintain the solid start to the season. I know I said it last week, but Carl is really shaping up to become a more solid addition to the cast. Chandler Riggs has really grown into his role. His adversity to using the gun felt believable, and it genuinely felt like he was acting like Rick’s son. I find it incredibly hard to believe they went thirty days without an incident, considering how bad it has been over the last two. No matter how many times they show that blonde woman crying over her husband, I’m just not going to be able to care. I cared more about the death of the piggies than that woman’s plight. Why aren’t there internal guards/ precautions against this kind of incident? Especially considering they took on the Governor’s people, and he’s still out there. This show strains too much on believability sometimes, and can really pull the viewer out of the experience. The girl upset over the death of Nick the Zombie was creepy, if a little over-acted. Hopefully the girl’s state of mind is brought back in later episodes. Biting the man’s neck so he wouldn’t scream? C’mon.